which fell to sand, aching for life. where we can’t see what happens. * Photo by Alan Pogue. BartonSpringsPublicProcess.com -- please take a minute to send the letters posted there, and/or one/s of your own. Aielli Unleashed: Listen to Bill Oliver, Danny Britt, Beth Gallager, Marvin Dykhuis sing and play tree and river songs. Susan Bright reads the poem above. 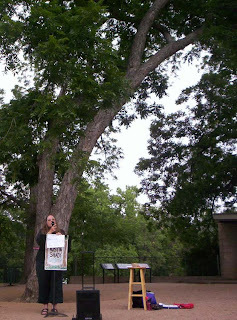 Bill Bunch talks about our Heritage Trees at Barton Springs. Press Conference: Announcing an Adopt-a-Tree program for the heritage trees at Barton Springs. Thursday, 11am to noon, entrance to Barton Springs pool. this beautiful old tree in the name of poetry. Action: Send a letter asking Council to strengthen, not dilute, City Code to protect Heritage trees. There will be a council briefing June 11, 2-3 pm, City Council Chambers. Bring Signs. Meetings are broadcast on municipal TV cable channel 6 and on 88.7 FM radio, starting at 1:30 p.m.